​RED has been dribbling out details of its much-delayed Hydrogen Onephone for a long time, but getting a proper summary of its features has been difficult. 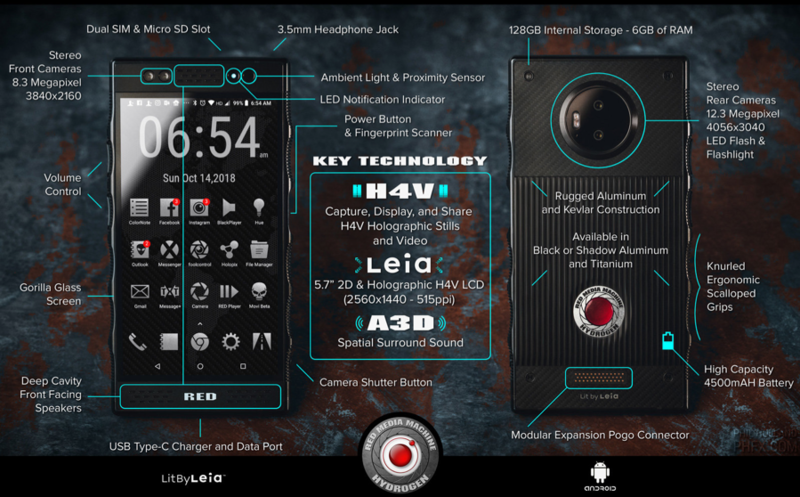 Director Phil Holland has published a "tech overview" infographic showing just what the phone includes. It has a 5.7-inch "holographic" LCD, dual front and back cameras the pogo pin connector for add-ons, 6GB of RAM, 4,500mAh battery and the "deep cavity" stereo speakers. The graphic below doesn't mention absolutely everything -- including the 2017-era Snapdragon 835 chip. Some have characterized the concept as buying a video tool with an attached phone. Pre-orders began shipping last week.